In case you haven’t heard, Teresa Collins has teamed up with Craftwell to create an eBosser….oh and it is gorgeous!! If you have been hemming and hawing over getting an eBosser, the good news is that now you can get a Teresa Collins eBosser AND you can get it at a great price too! Teresa will be on HSN on September 17th with an eBosser package that you won’t want to miss! I will make sure to post the times when we get closer so that you can keep your eyes glued to that screen and call in to get the eBosser. You don’t want to miss this deal! 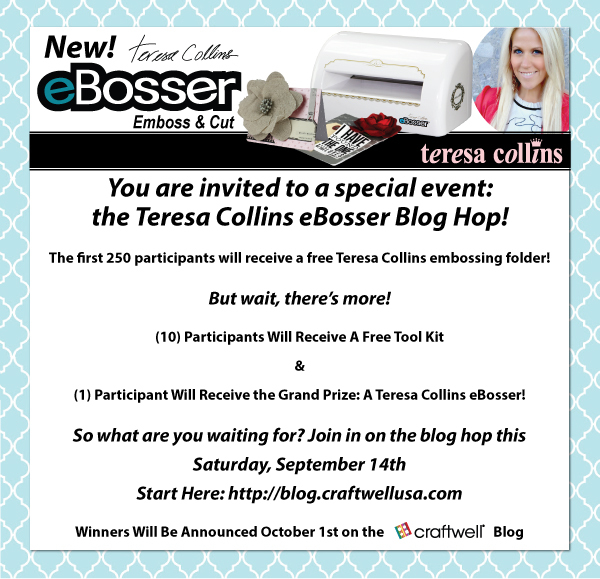 To celebrate all that the eBosser can do with the Teresa Collins style, we will be having a BLOG HOP with some tremendous giveaways! Tomorrow morning (bright and early especially if you want to be a winner ) go to blog.craftwellusa.com! Make sure to leave a comment on everyone’s blog for a chance to win! Comments will start at 8AM EST for the giveaways! The blog hop will only last for Saturday, September 14th and Sunday the 15th! This looks like a really great product, would love to have it. This beautiful paper looks great embossed, it makes this page pop! Nice layout! If Teresa connected with ebosser it must be great! I am a Big fan of Xyron & Teresa connected with Xyron. That must make ebosser as great as well. Thanks foe a chance to win !